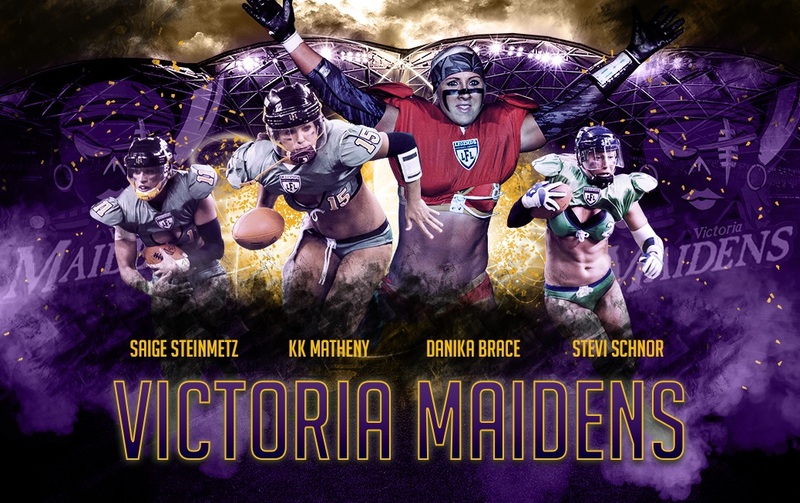 In the aftermath of the 2014 indoor female football season in the United States, a group of elite competitors shall be bringing their skills to the game down under. Among the ten women competing in Australia, looking to enhance the quality of the game while providing leadership, a pair of two-way threats may make the biggest mark. Saige Steinmetz from the Jacksonville Breeze and Stevi Schnoor from the Seattle Mist shall earn the rare opportunity to become teammates. Competing in opposite conferences, the two have never had the chance to see the other play. Making their way to the Victoria Maidens, the two may be the final pieces of a championship puzzle. Joining them in Victoria shall be Danika Brace, a former Mist player who served as a captain with the Las Vegas Sin. Quarterback KK Matheny, who played alongside Steinmetz with the Breeze, rounds out a remarkable quartet of elite female football talent. During the 2014 American indoor female football season, Steinmetz was the only player to finish among the top five in offensive and defensive leaders. Of note, Steinmetz ranked second in rushing with 305 yards, complemented by six touchdowns. Defensively, she finished fifth in league play in sacks. Accounting for 80% of the Breeze’s rushing yardage, Steinmetz also led the club with 309 combined yards from scrimmage. Her 11.5 total tackles ranked second on the Breeze, including an astounding 7.5 for loss, best among all Breeze commpetitors. Her season would culminate with an appearance in the Eastern Conference championship game, along with the honor of league MVP bestowed upon her. Equally adept at the running game is Schnoor. The Most Valuable Player at the 2013 Pacific Cup, Schnoor finished behind Steinmetz in rushing yards with 267, ranking third in league play. She accounted for 69% of the Mist’s rushing game, while also finishing second on the Mist in receptions. Her 334 combined yards from scrimmage were tops amongst all Mist competitors, earning her a league nomination for Most Outstanding Player on Offense. On the opposite side of the ball, Schnoor brought a well-rounded game. Her 8.5 total tackles ranked fourth on the Mist, while she led the club with 3 tackles for loss. In addition, she recovered two fumbles, establishing herself as an asset for the Mist. Both solid two-way competitors, they are both poised to capture the hearts and minds of fans down under, the way they have in the US. Regardless of the season’s outcome, the chance for novice players and fans alike to earn the chance to see their greatness shall make it one to remember.